Driscoll’s may be the U.S.’s most recognizable brand name on strawberry, raspberry, blueberry and blackberry cartons. Its conventional and organic berries can be found year-round everywhere from Sam’s Club to Whole Foods. To keep its berries stocked far and wide, the company uses a vast supplier network stretching from Canada to Argentina. But some of those suppliers are coming under fire for allegedly abusing workers, in the U.S. and Mexico. One Driscoll’s grower has spent weeks embroiled in a major farmworker protest, while a nearly two-year boycott against another grower recently intensified. Workers in both disputes have called for a boycott against the company. While Driscoll’s is a family-owned company, it’s no mom-and-pop operation. According to its website, over 40,000 people are involved in its berry production worldwide. The company has a code of conduct for its suppliers, called the “Promise for Workforce Welfare,” which includes obeying minimum legal requirements and avoiding egregious labor violations like human trafficking and conditions “posing immediate risk to life or limb.” Driscoll’s says it is committed to hiring suppliers that “show a sincere commitment” to such principles. But Bonifacio Martinez questions whether those requirements are enough. Martinez picked strawberries and blackberries destined for Driscoll’s boxes for 10 years. Now he’s a leader in the farmworker movement that erupted last month in the fields of San Quintin, in the Mexican state of Baja California. Thousands of farm laborers picking multiple crops stopped work for nearly two weeks, demanding higher wages and legally required benefits, among other protections. “The principal demand is for [growers] to actually respect the workers’ rights,” says Martinez. He wants them to honor labor laws that are, at the moment, he says, just “dead words.” Those include health benefits and freedom from sexual harassment. Many of the San Quintin protesters are indigenous people from some of Mexico’s poorest states, like Oaxaca and Guerrero. Indigenous people make up more than half of Mexico’s agricultural workers. The striking pickers initially wanted wages increased to 300 pesos a day, then lowered the demand to 200 pesos, about $13. Most of them earned $7 to $8 a day before the strike. Protests turned acrimonious when demonstrators threw rocks at government vehicles and police responded with tear gas and rubber bullets, reported the Los Angeles Times. Workers also blocked 56 miles of the Trans-Peninsular Highway. By April, the strike had effectively ended after growers signed agreements raising wages 15 percent—far less than the pickers demanded. The leaders of the movement rejected the meager increase, saying the unions that signed those agreements, which are affiliated with the Partido Revolucionario Institucional (PRI), which held power for nearly three-quarters of the 20th century and has strong connections to many unions throughout the country, do not represent workers. The workers continue protesting even as many have returned to the fields. According to statements by Driscoll’s and BerryMex, following the strike BerryMex increased the “earning opportunity” for its more than 4,000 workers to $5 to $9 an hour—well above the strikers’ demands and the growers’ concessions. “This pay increase means that each individual now has an average earning potential of six to 10 times of Mexico’s minimum Federal wage and as much as 16 times for higher performing workers,” the statements read. “This is a terrible lie,” says Martinez. He says BerryMex has raised its wages more than some of its peer growers, but only to 180 pesos a day, about $12. That’s a far cry from $5 to $9 dollars an hour. Others familiar with the protests expressed skepticism of the calculation as well. Pickers are paid based on how much they pick, not by hour. That means hourly rates for fast pickers under optimum conditions can far exceed average rates. In that case, the “earning opportunity” will not be the earning reality for most laborers. BerryMex is not just any Driscoll’s supplier. It is part of Reiter Affiliated Companies (RAC), which says it is “the largest fresh, multi-berry producer in the world.” Driscoll’s is RAC’s only customer. And RAC’s CEO, Garland Reiter, is the brother of Driscoll’s CEO Miles Reiter. Driscoll’s responded swiftly to the BerryMex fracas. But it was not as quick to act to resolve a dispute that escalated while the San Quintin protests raged: a bitter labor fight in Burlington, Washington. Familias Unidas por la Justicia (FUJ), which says it represents over 400 berry pickers, has been locked in a labor struggle with Driscoll’s supplier Sakuma Brothers Farms since 2013. FUJ has long held a boycott against Sakuma berries and its largest customers, Driscoll’s and Häagen-Dazs. On March 24, it doubled down on the boycott when the fair trade advocacy organization Fair World Project sent a letter to Driscoll’s, signed by nearly 10,000 consumers, asking it to suspend buying from Sakuma Brothers until the dispute is resolved. The signatories pledged not to buy Driscoll’s berries until then. FUJ’s list of complaints is long: poor wages, squalid labor camps, firing and retaliating against workers for organizing and hiring guestworkers from Mexico to replace FUJ’s members. The H-2A guestworker program Sakuma Brothers participated in is meant to be used only when there aren’t enough workers domestically. FUJ says it had plenty of willing workers, but that Sakuma Brothers used guestworkers to avoid hiring back FUJ’s members. “The only thing we want is a fair contract for both of us,” says FUJ president Ramon Torres. Sakuma Brothers denies that FUJ represents the berry pickers, calling them “outside agitators” who “have attempted to fabricate the impression that this is a worker movement.” Danny Weeden began his tenure as the company’s CEO just this year and says FUJ’s campaign is hard to understand. “We’re really doing everything and more than what they’re asking, but they just continue to misrepresent the facts,” he says. Weeden says that starting this season, the company will pay workers $10 an hour plus a generous bonus for each pound of berries picked. He says the housing is continually upgraded and that the company does suffer from a labor shortage. After nearly two years of deadlock, the Fair World Project and its nearly 10,000 consumer signatures finally prompted Driscoll’s to respond. In a statement, the company said it had hired “an independent, leading worker welfare organization” to audit Sakuma Brothers, and that the final audit showed that the company had “properly addressed any potential claims” of worker mistreatment. Felimon Pineda, FUJ’s vice president, doubts the audit’s accuracy. “If it’s true that people from Driscoll’s came to check Sakuma farms, the first thing they should have done was ask the farmworkers,” he says. “Because they’re the ones who feel the pain. They’re the ones who know the working conditions. Pineda, who is from Oaxaca, is a link between San Quintin and Burlington. For him, the connection between them runs deeper than boycotting Driscoll’s. He got his start picking strawberries at the age of 13 in a town in Baja California right next to the current protests. “I’m in solidarity with these people because they’re my people,” he says. The connection makes sense, says Gaspar Rivera, a binational advisor to the Frente Indigena de Organizaciones Binacionales and researcher at the UCLA Labor Center. Indigenous people have a history of picking berries, one of the hardest and least desirable farm jobs. Once they acquired berry-picking know-how in Mexico, many migrated all the way up to Washington to do the same work. Workers on both sides of the border are now leading boycotts against Driscoll’s, but it’s unclear whether the company’s actions will go beyond issuing statements. Although Driscoll’s requires its suppliers to commit to the Promise for Workforce Welfare, it says it will not intervene in labor negotiations. 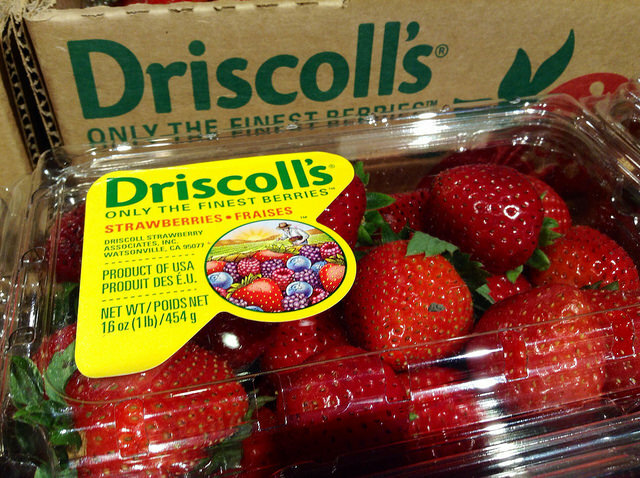 “Driscoll’s does not have a role in any labor negotiations between farmers and farmworkers,” the company says. “Our focus and responsibility is on worker welfare and ensuring legal compliance is adhered to by all our independent growers.” The company says it has never terminated a supplier for labor violations. >> The article above was written by Rachel Luban and is reprinted from In These Times.